Dutchman Ruben de Sain lost the use of his legs in a motorcycle accident ten years ago. Today, he is practicing with his new exoskeleton. Ruben takes part in a pilot project of the Sint Maartens Clinic in Nijmegen. In recent months we have practiced hard to control the suit and now the time has come to go beyond them. Ruben was a special moment: "Finally I can walk from A to B and look people straight in the eye. That's pretty emotional after ten years. " The suit is not currently in production for other patients. 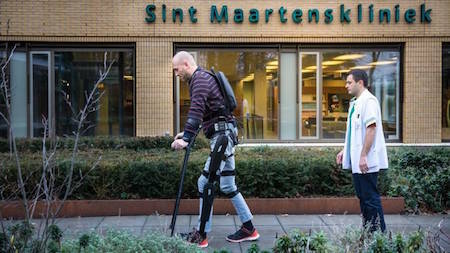 Rehabilitation Doctor Ilse de Nes, who accompanies Ruben says: "The robot suit will be developed further but we now find him so well that we're going to experiment with it I believe this is the is over fifteen years really a replacement. wheelchair." Ruben is now very excited about his exoskeleton. "It feels like Robocop without a weapon." [The] man was standing on two corrugated-soled titanium footplates. From the outer edge of each rose a narrow titanium T-beam that followed the line of his leg, with a joint (locked now) at the knee, up to another joint with a titanium pelvic girdle and shallow belly support. From the back of this girdle a T-spine rose to support a shoulder yoke and rib cage, all of the same metal. The rib cage was artistically slotted to save weight, so that curving strips followed the line of each of his very prominent ribs. There are some interesting sfnal predecessors for this idea. The earliest reference to the basic idea that I know of is the rigid metallic clothing that Edmund Hamilton wrote about in his 1932 story A Conquest of Two Worlds. Via NOS (and Google translate).